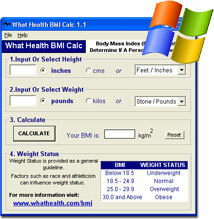 The What Health BMI Calculator is an easy to use body mass index calculator for Windows. Body Mass Index can be used to determine if a person is overweight. In keeping with the World Health Organization (W.H.O.) recommendations, only height and weight measurements are needed to calculate BMI. Gender input is not a requirement for this calculator. This software is provided as freeware and is available for download free of charge. This software can also be freely distributed for non-commercial purposes. NB: Weight Status displayed by this calculator should be viewed in context. For example, factors such as race and athleticism can affect a persons weight status. To find out more about interpreting weight status please visit our body mass index section. "Though it doesn't sport the most exciting design, this program quickly calculates your body mass index. You don't even have to install What Health BMI Calc--just unzip and run it. Its no-frills, compact interface has fields to enter height and weight. Both English and metric measurements are supported, so you don't have to do any conversions. Hit Calculate and your BMI and weight status are displayed. You won't find a Help file, but one isn't justified for a program as simple as What Health BMI Calc. If you want your own BMI calculator, this is an easy-to-use, if utilitarian, option that is offered free of charge." What Health BMI Calc is available in compressed and uncompressed formats. This web site also offers an online Body Mass Index Calculator, interactive BMI charts and general information about body mass index including the BMI formula.